730J6 Poly V Belt | 730-J6 Micro V Belts | Metric PJ1854 Motor Belt | 73 inch Ribbed Belt (1854mm) Length, 6 Ribs. 730J6 Poly-V Belt, Metric 6-PJ1854 Motor Belt. 730J4 Poly-V Belt, Metric 4-PJ1854 Drive Belt. 730J4 Belt (4-PJ1854). 730J-4 Poly-V (Micro-V) Belts, 73.0” Length. J Section Motor Belt replaces fitness belts, compressor belts, drive belts, and electric motor belts. PJ1854/730J, 4 Rib Poly-V Belt. 730J8 Poly-V Belt, BANDO. Metric 8-PJ1854 Motor Belt. 730J8 Belt (8-PJ1854). BANDO RIB ACE Industrial Grade 730J-8 Poly-V (Micro-V) Belts. 73” OC Length: J Section Motor Belt replaces fitness belts, compressor belts, drive belts, and electric motor belts. PJ1854/730J, 8 Rib Poly-V Belt. 730J10 Poly-V Belt, Metric 10-PJ1854 Motor Belt. 730J10 Belt (10-PJ1854). 730J-10 Poly-V (Micro-V) Belts. 73” Length: J Section Motor Belt replaces fitness belts, compressor belts, 730J drive belts, and electric motor belts. PJ1854/730J-10 rib Poly-V Belt. 730J16 Poly-V Belt, Metric 16-PJ1854 Drive Belt. 730J16 Belt (16-PJ1854). 730J-16 Poly-V (Micro-V) Belts. 73” Length. J Section Motor Belt replaces fitness belts, compressor belts, drive belts, and electric motor belts. PJ1854/730J, 16 Rib Poly-V Belt. 730J20 Poly-V Belt, Metric 20-PJ1854 Motor Belt. 730J20 Belt (20-PJ1854). 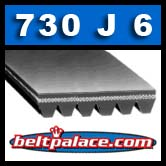 730J-20 Poly-V (Micro-V) Belts: 73” OC Length: J Section Motor Belt replaces fitness belts, compressor belts, drive belts, and electric motor belts. PJ1854/730J, 20 Rib Poly-V Belt.